At this point, I am asking myself, can Fan Bing Bing (范冰冰) do any wrong? As far as I have been posting about what the actress wore, most or all of them have been a hit and she was never a victim of fashion. She's an example of someone wearing fashion and not fashion that wears her. The glowing fashion star made an appearance at 'The Tree of Life' premiere held during the 64th Cannes Film Festival on May 16, 2011. She wore a lime green gown from Oscar de la Renta Spring/Summer 2011. Her usual braided hairstyle, Roger Vivier clutch, Cartier earrings and an orange lip to complete yet another great look. 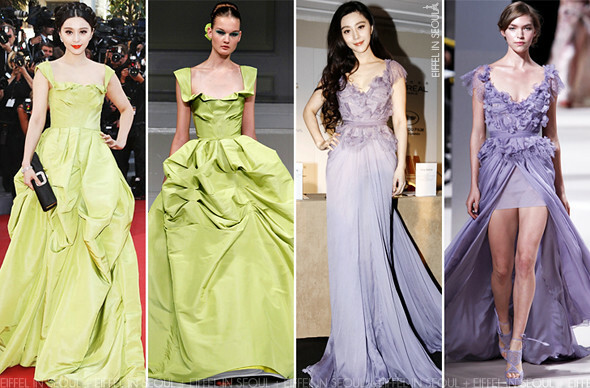 Making another appearance on May 17, 2011 wearing a lavendar chiffon gown from Elie Saab Spring/Summer 2011 Haute Couture to Marché du Film China Night Gallery. What a stunning look, the color looks great on her. Fan Bing Bing (范冰冰) definitely proved to us that you don't have to pile tons of jeweleries to look stunning. She looks perfect. Not really feeling the Oscar de la Renta dress. Maybe it's just in this picture but I don't like how the dress falls heavily on her, and it looks a little crumpl-y. The fit on the bodice also looks weird. I think the dress makes her look more like an awkward debutante rather than the glamorous actress that she is. I do like the clutch and the red lips. The hair, not so much. But that's just me. :) Her other look, though, the Elie Saab and the rest of her Cannes outfits, were divine. Hello Willow! Thanks for the feedback and the long comments you've been writing. I appreciate it and I am glad to know that you're enjoying the site. Thank You!